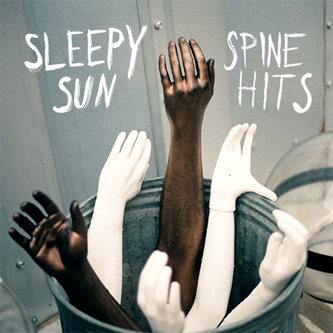 "Sleepy Sun's miles, months, and days in the van are a tangible presence in Spine Hits, an LP of whimsy, restlessness, and urgency that leaps nimbly from landscape to landscape with ease, irreverence, and a catch-em-before-they-ain't changeling nature. For the most part, the sprawling Zeppelin-esque epics that defined much of Embrace and Fever have been traded in for a potent pop-compact framework. But never at the expense of the dodging, juking, and downshifting instincts that set their older long form pieces apart from a thousand other psychedelic drone warriors. Recorded under the big skies of the California high desert with Queens of Stone Age and Eagles of Death Metal alumnus Dave Catching, the jams on Spine Hits are alternatingly precision whittled and moodily muscular. Matt Holliman and Evan Reiss' guitars adroitly move from steamroller heavy to beachside airy and bouncing to interstellar- tinkering with texture and dynamics like never before. Vocalist Bret Constantino sings with a road-toughened, husky soul yowl and hush that occasionally betrays a society-weary frustration but more often hints at a way out. The rhythm section of drummer Brian Tice and Jack Allen is a super- cohesive, tricky, and tough-as-hell unit that keeps the Sleepy train on track as it teeters, creeps and runs wild across the land. To any seasoned Sleepy Sun listener the new destinations will be surprises and revelations. "V.O.G." hints at a backstage conspiracy hatched on the Arctic Monkeys tour- buoyant and tight as a wire. "Boat Trip" moseys with a Lou Reed offhandedness- a postcard from Brian Wilson's forgotten vacation with the Velvets. "Still Breathing" is an elegiac nod to the band's early alignment with the Verve's dreamworlds. For Sleepy spotters that came to love the band in its most massively rocking incarnations, there are the slow burns- "Stivey Pond" a sinister, stalking, and tender lurching beast bearing down on the subject of its obsession. And "Lioness (Requiem)" - a drifting, drowsy, late night lost in contemplation, dawn nowhere in sight. Spine Hits isn't a portrait of a band in a moment. It's a box of snapshots spilled on the floor and blowing in the wind...left behind by a band that can't stop moving, but remembers what they left behind in a thousand colors."